Enhance the power of your contact lens cleaning routine by adding Ultrazyme Universal Protein Cleaner to your contact lens solution. 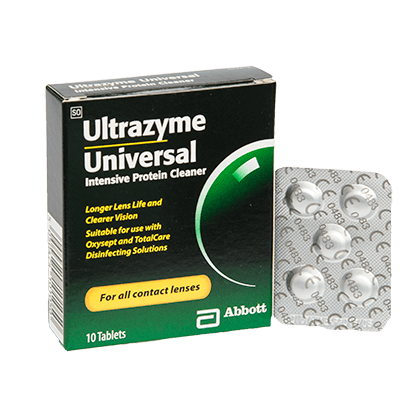 Ultrazyme Universal is an impressive tablet that, when dissolved in solution, increases the intensity of the clean, ensuring all proteins and build-up are thoroughly removed from your contact lenses. As well as eliminating these irritants, the solution works to protect your lenses from further accumulation of dirt and other bacteria. Excessive build-up on your lenses can disturb your vision. Exclusively manufactured by AMO, Ultrazyme Universal Protein Cleaner will help ensure that you maintain brilliant visual clarity through the day when used correctly with a dissolving solution. Ultrazyme Universal can be paired with Total Care or Oxysept 1 Step solution to deliver unrivalled hygiene for you and your contact lenses. Brilliant product, does the job perfectly. I’ve used this product for years and it is totally reliable and does what it says. Ideal as difficult to source in high street shops.